As an administrator, you may need to lock a subscription, resource group, or resource to prevent other users in your organization from accidentally deleting or modifying critical resources. You can set the lock level to CanNotDelete or ReadOnly. In the portal, the locks are called Delete and Read-only respectively. CanNotDelete means authorized users can still read and modify a resource, but they can't delete the resource. ReadOnly means authorized users can read a resource, but they can't delete or update the resource. Applying this lock is similar to restricting all authorized users to the permissions granted by the Reader role. When you apply a lock at a parent scope, all resources within that scope inherit the same lock. Even resources you add later inherit the lock from the parent. The most restrictive lock in the inheritance takes precedence. Unlike role-based access control, you use management locks to apply a restriction across all users and roles. To learn about setting permissions for users and roles, see Azure Role-based Access Control. 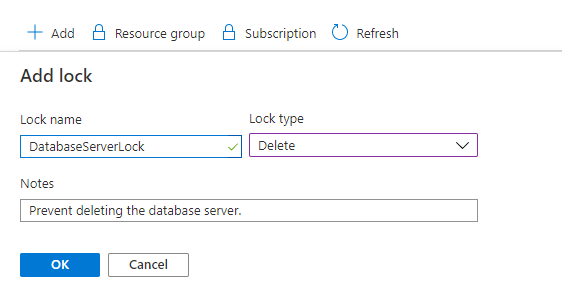 Resource Manager locks apply only to operations that happen in the management plane, which consists of operations sent to https://management.azure.com. The locks don't restrict how resources perform their own functions. Resource changes are restricted, but resource operations aren't restricted. For example, a ReadOnly lock on a SQL Database prevents you from deleting or modifying the database. It doesn't prevent you from creating, updating, or deleting data in the database. Data transactions are permitted because those operations aren't sent to https://management.azure.com. Applying ReadOnly can lead to unexpected results because some operations that seem like read operations actually require additional actions. For example, placing a ReadOnly lock on a storage account prevents all users from listing the keys. The list keys operation is handled through a POST request because the returned keys are available for write operations. For another example, placing a ReadOnly lock on an App Service resource prevents Visual Studio Server Explorer from displaying files for the resource because that interaction requires write access. To create or delete management locks, you must have access to Microsoft.Authorization/* or Microsoft.Authorization/locks/* actions. Of the built-in roles, only Owner and User Access Administrator are granted those actions. Some Azure services, such as Azure Databricks, use managed applications to implement the service. In that case, the service creates two resource groups. One resource group contains an overview of the service and isn't locked. The other resource group contains the infrastructure for the service and is locked. If you try to delete the infrastructure resource group, you get an error stating that the resource group is locked. If you try to delete the lock for the infrastructure resource group, you get an error stating that the lock can't be deleted because it's owned by a system application. Instead, delete the service, which also deletes the infrastructure resource group. For managed applications, select the service you deployed. Notice the service includes a link for a Managed Resource Group. That resource group holds the infrastructure and is locked. It can't be directly deleted. To delete everything for the service, including the locked infrastructure resource group, select Delete for the service. In the Settings blade for the resource, resource group, or subscription that you wish to lock, select Locks. To add a lock, select Add. If you want to create a lock at a parent level, select the parent. The currently selected resource inherits the lock from the parent. For example, you could lock the resource group to apply a lock to all its resources. Give the lock a name and lock level. Optionally, you can add notes that describe the lock. To delete the lock, select the ellipsis and Delete from the available options. When using a Resource Manager template to deploy a lock, you use different values for the name and type depending on the scope of the lock. The following example shows a template that creates an app service plan, a web site, and a lock on the web site. The resource type of the lock is the resource type of the resource to lock and /providers/locks. The name of the lock is created by concatenating the resource name with /Microsoft.Authorization/ and the name of the lock. "notes": "Site should not be deleted." 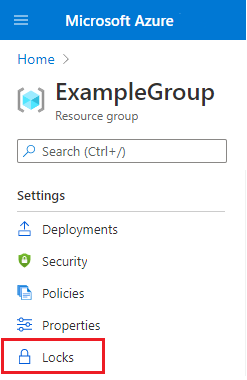 For an example of setting a lock on a resource group, see Create a resource group and lock it. You lock deployed resources with Azure PowerShell by using the New-AzResourceLock command. To lock a resource, provide the name of the resource, its resource type, and its resource group name. To lock a resource group, provide the name of the resource group. You lock deployed resources with Azure CLI by using the az lock create command. az lock list --resource-group exampleresourcegroup --resource-name examplesite --namespace Microsoft.Web --resource-type sites --parent ""
You can lock deployed resources with the REST API for management locks. The REST API enables you to create and delete locks, and retrieve information about existing locks. The scope could be a subscription, resource group, or resource. The lock-name is whatever you want to call the lock. For api-version, use 2016-09-01. In the request, include a JSON object that specifies the properties for the lock. You can apply restrictions and conventions across your subscription with customized policies. For more information, see What is Azure Policy?. 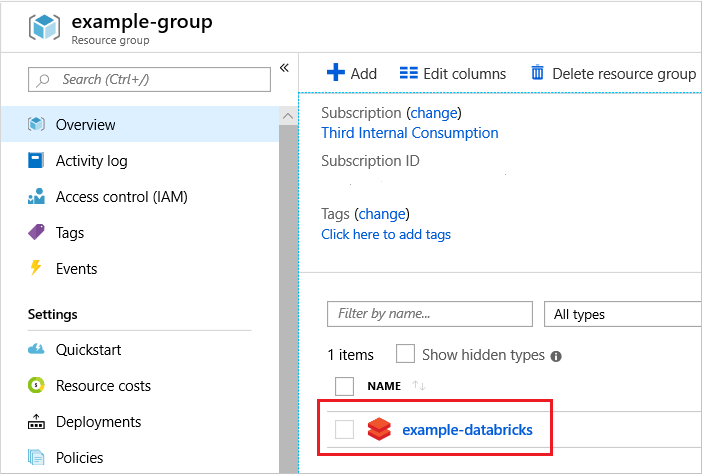 For guidance on how enterprises can use Resource Manager to effectively manage subscriptions, see Azure enterprise scaffold - prescriptive subscription governance.